Taste test: OK, I was dubious. I looked at these a number of times in the store and just couldn't quite bring myself to try them. I knew it was my duty, but these just never sounded appealing. I was finally convinced when I was given some at a party. The next day, I went to get a packet of my own. While it seems to be a crime against nature to mix lime and pepper with the goodness of a potato chip, I can assure you this isn't the case. Quite simply, these rock. They are insanely addictive. 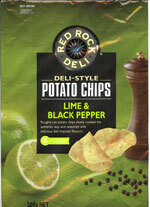 The tangy kick of the lime, the gentle undertone of pepper and a truly delicious chip ... what a combination! The chips themselves are roughly cut which helps a lot. Kudos to Red Rock Deli. Smell test: Quite a strong aroma of pepper with a hint of lime.